A South Florida bank announced it is setting up a correspondent banking relationship with a Cuban financial institution. Pompano Beach-based Stonegate Bank said Wednesday it has reached an agreement with Banco Internacional de Comercio. The Miami Herald reported it's the first correspondent banking deal signed by a U.S. bank with Cuba since the two countries re-established diplomatic relations Monday and reopened embassies after more than 54 years. 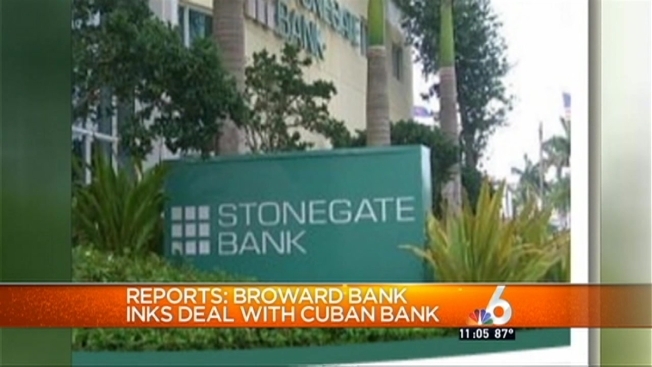 Stonegate has 21 Florida branches and since May has been the bank that handles the accounts of Cuba's diplomatic missions in the U.S. Under financial regulations outlined by the U.S. Treasury Department in January, American banks are allowed to open correspondent accounts in Cuban banks. U.S. travelers are also permitted to use credit and debit cards in Cuba.